Peter Russell sold two television pilots in 2017. He enjoys working on projects both as a ghostwriter and as a consultant. And he can both write, and teach what he knows. So many successful screenwriters and producers have no idea how to teach what they do, and so many teachers can’t actually sell stories. Peter was UCLA’s Teacher of the Year in 2009. He invented (along with his then partner Cecilia Najar) a process called The Storymaker which you can use to quickly develop an original, complex, vivid story from a single idea — and the Storymaker is helping scores of his students shape wonderful stories. He can help you. It’s his passion to do so. 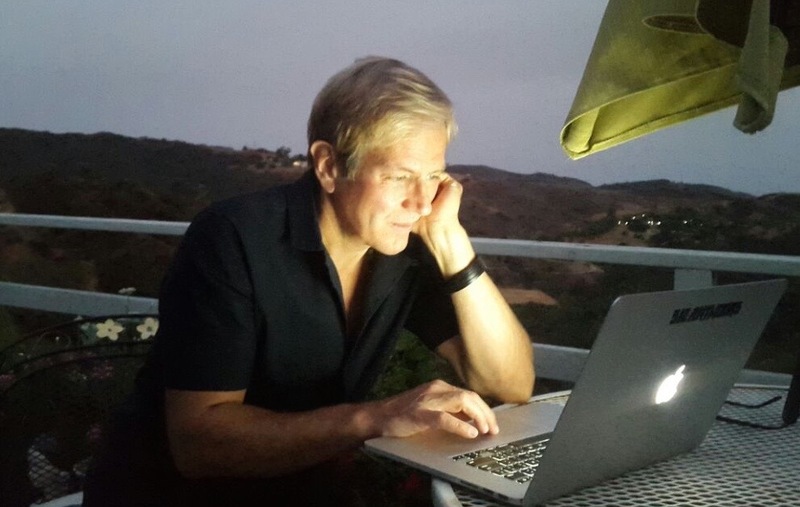 Peter started as a story analyst in the 1990s, and has read over 6,000+ screenplays for major film and television giants including Imagine Entertainment, Participant Productions, HBO, CBS, Walden Entertainment and dozens of others. As he read these scripts, he started seeing deep, hidden patterns in the best stories. He wrote these down and started getting jobs FIXING writer’s stories. He got good at it — really good. Peter was invited to teach at UCLA in 2004, and it became a passion, too. He has now been invited to teach television pilot and film story creation at Pepperdine University’s Seaver College Screenwriting MFA program, at Story Expo in LA and New York, and many others. Meanwhile, Peter has turned The Storymaker into the most powerful tool for helping storytellers create original vivid stories. Simply and quickly. Peter loves working with both new and experienced writers to help them realize their vision. The appetite for story in Hollywood is booming. Peter is ready to help you create stories that the world needs. How Do You Tell a Story an Audience Will Love? Peter believes that original stories in 2014 are NOT what they were just five years ago. Audiences today are incredibly sophisticated. Plot doesn’t really matter – we’ve seen all the plots. Original, vivid CHARACTERS are where hit movies and TV work now. Peter has learned the hidden patterns and tools that make audiences FEEL things. Take James Cameron – his movies hit BIG. But while the stories themselves are not life shatteringly different, it’s how he exploits and uses the rules, tricks and devices of his chosen genre to MOVE his audiences. Gilligan, Weiner, Tarantino, Nolan, Cameron, Bigelow, Apatow, Milch, Scorsese, Whedon …you name it. They use these hidden patterns, too. Understanding a genre’s particular story structure to its core lets a creator FORGET about plot, and simply improvise wildly, like a great jazz musician who long ago mastered scales, keys and beats, and can now be ORIGINAL. As a teacher of writing and lover of storytelling, I am obsessed with helping artists find and nurture their unique voice and vision. I want nothing more than to help all my students learn the rules of storytelling and then stretch them. As a story analyst for companies like Imagine Entertainment, Participant, Walden Media and many, many others, I’ve read literally thousands of screenplays and are still actively doing it. Most are not good. I wish they were. I would love to read every screenplay and be captivated by the characters and the writer’s specific view of the world. But that’s not the case. Most screenplays I read tell a pretty good story – but the story doesn’t add up to much. Why? Because there’s a difference between telling a story and being a storyteller. Find a friend who is not movie literate. Someone who sees, perhaps, just a handful of movies every year or so. Ask them to indulge you. Sit them down and tell them the story of The Godfather. Better still, go to Wikipedia and read them the plot of the Godfather. Read it word for word. Go ahead and make it as dramatic as you can. Now ask them, what did they feel? What did they remember from the story? Anything? Once upon a time we all sat around a campfire with our hairy Neanderthal family and friends. As we munched on turkey bones and sizzling gristle, one venerable member of our pack, our shaman, would sit in the place of honor, don the biggest feather band, and gather a collection of twigs and drums. The shaman would announce the beginning of the story with a massive drum roll. With a loud screech and a flourish of trills, he would end his tribal opening credits and begin the tale. Today, we would see this honored shaman as our Hollywood director. The twigs and drums? That’s the FX — the special effects and music track for when things get tense, scary or happy. The colorful head dress? That’s to dazzle the audience — this is show business, people. Even back when we wore loin cloths and spoke in grunts the shaman knew to make it big! Make it beautiful! This is show business – its not tell-business. Feathered head dresses are great for telling stories. Though we can’t be scientific about it, I’d imagine the story would last as long as the fire, roughly two hours. About the same amount of time as a movie. Our Neanderthal ancestors would laugh, cry, be amazed — and then all leave the campfire feeling something pleasurable and exciting — a transportation of the spirit. They’d remember the feelings. For those 120 minutes they’d stare at those flickering flames and imagine the world as it was shown through words, images and sounds. The stresses of hunting three toe sloths and fighting off saber tooth tigers–GONE. No more worries about gathering more nuts and berries. The next night when the fire was lit, the crowd would come back hoping for another good tale. To experience the feelings. Not because of a great plot, but the crowd came to enjoy the rushes of emotion that the shaman’s story created. We sit in a dark room and let a dream come to life. It’s waking sleep. And unlike a novel, where you imagine the world personally, this is a world that feels real because you see and hear it without effort. The world is impressed on our memories and hearts like a direct hit from a wonderful drug. Because that’s what movies are–DRUGS. Designed drugs delivered in the form of images, timing, characters and dialogue. We go to movies, and watch television, to get swept into a feeling. We want to get caught in a moment. Enter into a world we could never get to. Find ourselves seeing, being and feeling in situations of someone else’s imagination. Emotion is why stories grab us. It doesn’t grab our heads. It grabs our hearts. There’ s a kind of story that does grab your head, like INCEPTION, but only for people who get a big charge out of thinking – that’s why mystery thrillers are structured the precise way they are — for their own particular audience. People don’t say “come on, guys, I feel like going to see a movie PLOT!” No, they say “I want to laugh” or “I want to cry.” That’s how they select a movie, or decide to binge watch a Netflix series. But creating a precise feeling is what’s most important. I’ve studied thousands of stories, and I’ve learned how they create their feelings (different genres create whole different sets of feelings). I’ve found scores of these hidden patterns. They are what I use in my story consulting business for the studios. And they are what I teach at PeterRussellScriptDoctor.com. This creation is both science and art, and in screenplay it is evoked through precise, powerful structures. Not plot. What I teach is beyond plot. I teach how to evoke feelings and your feelings are brought to life on the page. That’s all a great movie story is. And I can help you learn how to do it.